Thanks to the buyer’s low cost of leverage, the $123 million purchase price exceeded the highest all-cash bid for the same portfolio by more than $53 million, according to Bill Hoffman, president of Trigild. Special servicers know that foreclosing on a CMBS loan in today’s weakened market is a losing proposition. For one, the potential to recoup an outstanding loan balance through foreclosure and an asset sale is often slim because buyers in today’s depressed market conditions can’t, or won’t, pay high prices for an unstabilized asset. Leveraged buyers have limited access to capital because lenders are generally offering loan-to-value ratios between 60% and 70%. And few lenders will fund a loan to buy real estate with the kind of vacancy and deferred maintenance issues that usually come with foreclosed properties. That leaves cash buyers to dominate the market for foreclosed assets. Cash buyers tend to bid lower than leveraged buyers due to an expectation of higher annual returns to compensate for the increased risk of equity investments. Add in the special servicer’s holding and property operations costs that come with the months it takes to foreclose, make repairs and reposition a property for sale after taking the title, and the prospects for recovering the remaining principal on a CMBS loan grow downright dismal. Offering assumable financing gives today’s leveraged buyers access to the low cost of capital that comes with loans originated in the less austere lending environment that existed before the financial crisis, according to attorney Mark Weibel, a partner in the Dallas office of law firm Thompson & Knight. 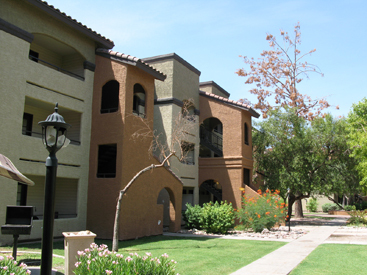 In the Arizona case, the borrower financed the seven multifamily projects with a $164.5 million CMBS loan at 5.7% interest in 2007, according to New York-based Trepp LLC, which closely tracks the CMBS market. Bethany Properties abandoned the seven multifamily projects and their residents in April 2009, leaving behind unpaid employees and suppliers and deferred maintenance on the 2,759 apartments. The court appointed Trigild receiver in April 2009 and the company restored order, made repairs and increased occupancy to position the assets for a profitable sale. In the court case, the borrower insisted that the special servicer, who acts as the lender on the loan, would have to foreclose to obtain the property’s title before it could be sold. The unpaid balance on the loan, which will be modified for the sale to Standard Portfolio, is more than $162 million, according to Trepp. The newest property in the Arizona portfolio is Alante at the Islands, built in 1996 in Chandler, Ariz., while the rest were built in the 1970s and 1980s. The other assets include Laguna Village and Santana Crossing in Chandler, Whispering Meadows and Tuscany Palm in Mesa, Sienna Springs in Phoenix and Verrado Park in Glendale. If assumable financing can recover the most funds possible, why aren’t special servicers offering the collateral properties from defaulted CMBS loans for sale with assumable financing? The chief reason is that laws regulating CMBS don’t give them that option. For special servicers and other debt holders, the very act of foreclosing in order to gain title of an asset for sale wipes out the original debt, so there is no longer a loan to assume. In other words, foreclosure removes the possibility of assumable financing. Special servicers can’t offer seller financing by creating new debt in the CMBS pools they manage because laws regulating real estate mortgage investment conduits (REMICs) preclude the addition of new debt to completed CMBS transactions. The only way for a new owner to take advantage of the low-cost debt in an existing CMBS pool is to take the place of an existing borrower on an existing loan. Bringing in a new borrower to take the place of a non-performing borrower is good for CMBS bondholders because the loan continues to generate payments of principal and interest. In most states, however, laws either prevent or don’t specifically allow receivers to modify CMBS loans in order to designate a new borrower. That’s why the Arizona case couldn’t move forward without the superior court’s ruling. That court record provides a basis for similar receivership sales in Arizona. Receivers like Trigild want other states to allow sales out of receivership, which could provide flexibility to deal more quickly and effectively with a mountain of defaulted CMBS loans. Weibel of Thompson & Knight says his capital markets group has worked on receivership sales issues in Texas, Minnesota, California, Colorado and Utah within the past six months, and the group has at least 25 cases pending. Hoffman estimates that about 10 states already allow receivers to modify CMBS loans for assumption when they sell properties, while most states lack clear laws regulating the process and some specifically prevent it.